Get up close and personal with nature at the River Legacy Living Science Center: Discover fascinating facts about the critters that share our living space at one of the area’s most unusual museums—then go play amongst them in the gorgeous urban oasis that is River Legacy Park. Bring a picnic lunch and make plans to spend an hour or two hiking, biking, or having fun with your kids on the playground. Take a hike at Southwest Nature Preserve: One of Arlington’s “hidden gems” is a 58-acre green space that affords dramatic bluffside views, native plant communities, and walking trails. Tip: Visit before dawn to experience a memorable sunrise. The park opens at 5 am! Explore Crystal Canyon Natural Area: This 40-acre “geology lover’s paradise” is one of the most interesting outdoor destinations in Arlington, featuring a diverse abundance of natural resources, a walking trail, and plenty of woodsy views. Visit the UTA Planetarium: Spend spring break among the stars at one of Arlington’s coolest destinations. Now showing: “Out There,” the journey to discover other worlds like our own; “Time Space,” a solar adventure that spans 14 billion years; and the always-popular “Pink Floyd,” featuring surreal and immersive effects set against a sound wall of classic rock. 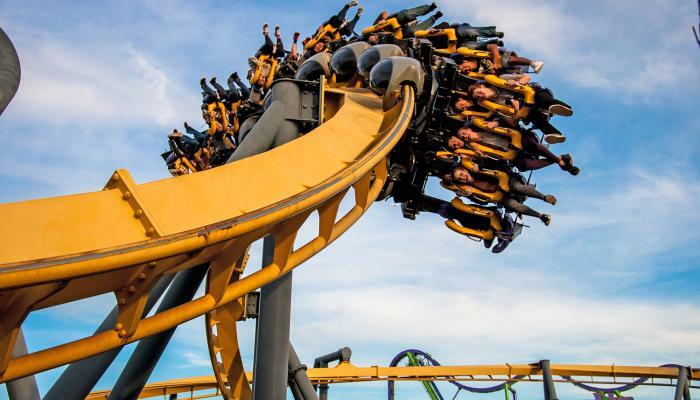 Get your scream on at Six Flags Over Texas: Thrill seekers should definitely check out the Titan, a twisted hypercoaster with 255-foot drops and speeds of up to 85 miles per hour; or find out if you’ve got what it takes to survive Mr. Freeze: Reverse Blast, featuring stomach-dropping backwards plunges that propel you upside down into a 180-degree inversion. Don’t forget to hit up new rides like THE RIDDLER Revenge and The Joker free-fly coaster. Discover more Six Flags thrill rides. Do a little racing at K1 Speed: Satisfy that need for speed with an afternoon of high-performance electronic karting on an indoor track, then enjoy a snack while you browse K1’s collection of racing memorabilia. Play hard at Alley Cats Entertainment: If you can’t find a good time at Alley Cats, you’re just not trying. Enjoy one-stop fun in the form of bowling, arcade games, Putt-Putt Golf, batting cages, rock climbing, laser tag and more. Get your nostalgia fix at Free Play Arlington: Inject an old school vibe into your spring break with all-you-can-play-for-$10 retro arcade and pinball games, plus grown-up bar food and bevvies. Skate your spring break away at Ice at the Parks: Is there anything quite like the feeling of gliding across a sheet of snowy, white ice? Take a few turns around the rink (or sign up for a private lesson), then catch a movie upstairs or head off for some power shopping. Take in an evening of live music: Arlington’s not Austin or Branson, but that doesn’t mean you can’t catch a good band or singer/songwriter at venues across town. Worth exploring: Arlington Music Hall, Brickhouse Lounge, Grease Monkey, J.R. Bentley’s, J. Gilligan’s, and Stumpy’s Blues Bar, just to name a few spots. Craft Beer Adventures: Stein or mug? Pale or dark? Buttery or bitter? So many craft beer options, so little time – so you better get this spring break party started with a happy hour or two spent at one of Arlington’s craft beer destinations, such as Division Brewing, Hooligan’s, Humperdinks, or Legal Draft. Do the Division Street Dive Bar Crawl: If you like budget-friendly cocktails poured with a healthy shot of people watching, the legendary dive bars of Division Street in Arlington are an absolute must. Start on the west side of the Arlington-Fort Worth border at Ozzie Rabbit Lodge, then make your way downtown with stops at Stumpy’s Blues Bar, Caves Lounge, Milo’s Upscale Dive Bar, or any other joint that strikes your fancy. (Don’t forget to designate a driver or arrange for a ride before you head out for the evening). Visit the Arlington Museum of Art: If you haven’t yet experienced this wonderful museum in Downtown Arlington, you’re just flat missing out—especially during March, when you can check out the museum’s annual Youth Art Month exhibit. Take a trip back in time at Top O’ Hill Terrace: Would you believe that a tiny Baptist university in west Arlington was once the site of a Prohibition-era gambling casino? It’s true, and you can learn all about Arlington’s secret past as “Vegas before there was a Vegas” when you take a Top O’ Hill tour. Dive in to local history at the Fielder House Museum: Learn more about Arlington’s founding mothers and fathers, as well as our evolution from small farming community to one of the largest cities in the United States. (Be sure and check out the museum’s butterfly garden after your visit). Experience an AT&T Stadium Art Tour: Go behind the scenes at one of the world’s top sporting and event venues, where you can investigate stadium landmarks like the playing field, press club, and interview room, as well as view and learn more about the stadium’s famous collection of fine art. Self-guided and staff guided VIP tour options are available.